Tracey Kirker working in her garden studio on the outskirts of Lewes. 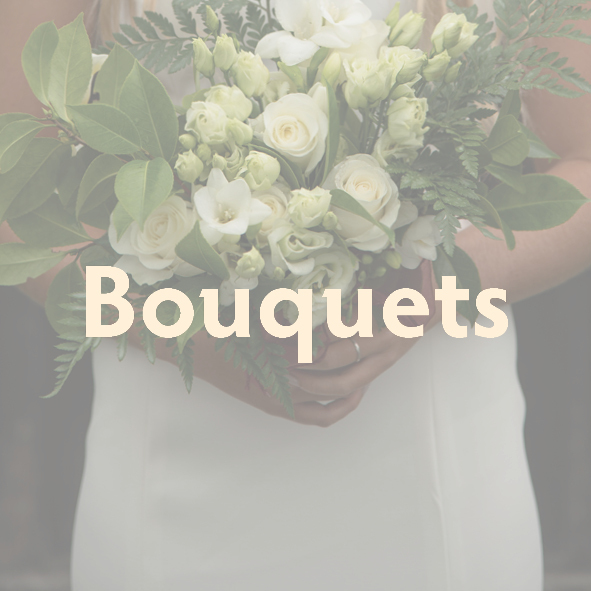 Darling Buds of Sussex is a bespoke wedding and events floral design business based in the lovely historic town of Lewes, near Brighton. Work and pleasure overlap to create wedding designs that allow flowers to display their natural character, charm and beauty. 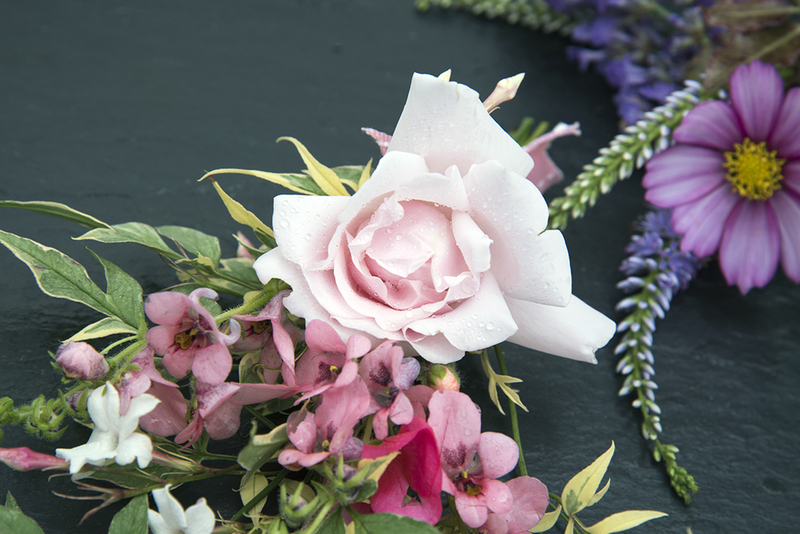 Inspiration and creative thought for our designs comes from the flowers themselves – so you may well find a single lavender stem in a bouquet to represent love, or rosemary in a buttonhole for everlasting luck. 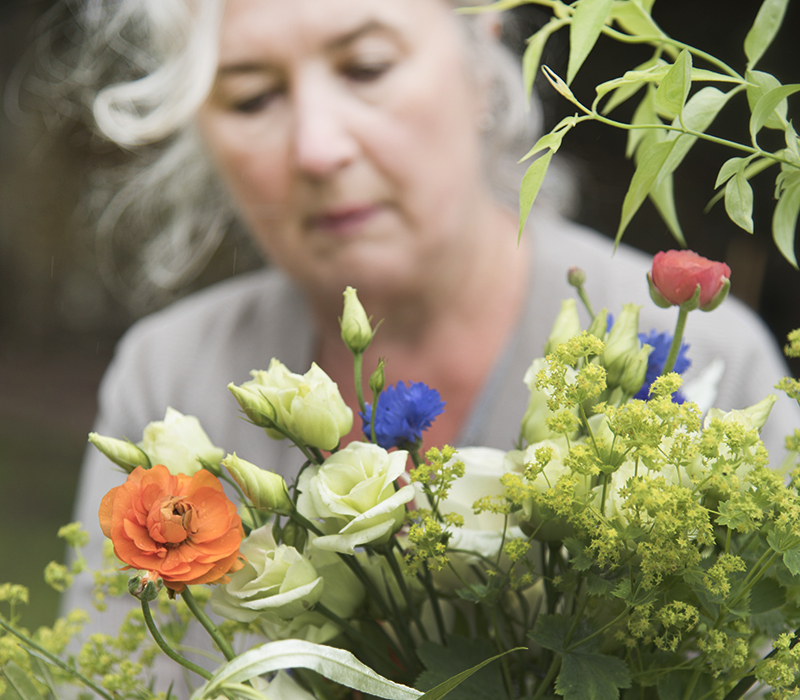 Being able to source locally and design with the best available seasonal flowers is fundamental to the way we work and the way we are inspired. We use British-grown flowers and foliage where at all possible either from carefully chosen local growers and flower farms, or from our garden at Barn Hatch in Lewes. Who is behind Darling Buds of Sussex? Tracey Kirker is the owner and creative heart of Darling Buds of Sussex. "For me floral design is an extension of my love of gardening and my training as a textile artist – I don’t do ‘paint by numbers’ nor do I follow a formula – I trust my trained eye, follow my senses and seek to create energy, balance and rhythm in all my floral work." Tracey loves the personality of foxgloves, the scent of old garden roses, and the delicate colour of nigella. She also likes too much eye makeup, eating hot cross buns all year round and the smell and feel of newly laundered sheets on the bed. Our favoured house style celebrates the wild and natural, usually in asymmetric designs, mixing interesting textures with pleasing seasonal colour combinations and trailing foliage. If you lean more towards faded vintage schemes or prefer opulent and sumptuous blooms or indeed a more simple, sophisticated and classic scheme, we will be equally delighted to translate your ideas and deliver your vision. If you are a bride with less visual clarity or just need help to refine your many ideas – we can spend time working together, using props and mood boards to define your style and create something that is perfectly you. Darling Buds of Sussex is genuinely different from the High Street, offering a more personal, relaxed and informed experience with a high level of design and ongoing commitment to using the best local and seasonal flowers.